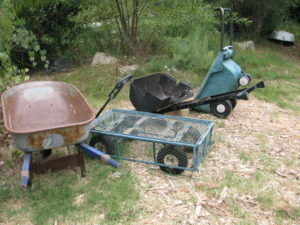 When your garden carts just won’t do the job: Introducing the Bar-Be-Rolla. 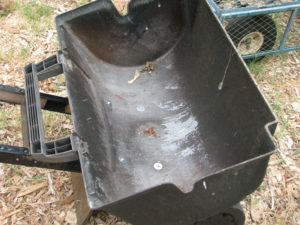 Its a lightweight wheeled cart that can hold liquids or solids, piles of wood, scraps of urbanite, mulch, wet mud, etc. And as you can see, its almost entirely made from an abandoned Bar-B-Que grill. My friend Louis, who has contributed inventions and repairs to Finch Frolic Garden, saw the neighbor’s grill set out for garbage, and then saw possibilities. Because the dome, which became the bucket, is made of aluminum, this gadget is super light. The original tires may need to be replaced with stronger ones, but otherwise it works just great. And one less item for the dump. 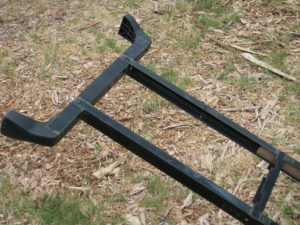 The legs became the handle, with added wood in between for connection. A board was used to make it stand up when resting, only because that was at hand. 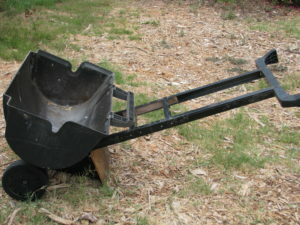 If you make your own, be sure that the board, or whatever you use as a kickstand, is high enough to clear the ground when the device is being wheeled. I think this is a brilliant re-purposing of someone else’s junk. And fun to say. Bar-Be-Rolla. Even Jane Fonda might like one!